Yes...I made banana muffins again! It seems to be a reoccurring theme around here. The reason why I make them so frequently is the kids devour them, there are so many variations (that make them taste totally different) and they can be made totally healthy and vegan or totally indulgent. The following recipe is how I made them and everyone loved them. I have included in the brackets how you adjust the ingredients to yield a slightly more decadent cafe style banana muffin/cake. I always make my muffins in the mini cupcake pan so they are perfect for little hands, but you could easily make regular sized muffins or even a cake with this recipe. In addition to the mini muffins (you can see one in the picture below) I also made heart shaped muffins as well. Valentine's is usually a time when people go all out with dinner. Some people who never cook are suddenly inspired and attempt a 5 course meal or at the very least a fancy dessert. The other option is the over crowded restaurant. Seeing as I make dinner every single night of the week, from scratch, I thought Valentine's was the perfect day to make something a little different and get into the spirit of things. This recipe is really more of a guide. Just like ordering a pizza you can put what ever toppings you enjoy on the pizza. A store bought crust is the perfect base for this dinner along with some salad and a dessert. Any shape pizza could be cut out of the crust but the large heart wastes the least crust and the mini ones maximize the crust as well. If you are like me you are always trying to infuse your meals with extra flavour but without extra salt, sugar and sauces laden with preservatives. Herbs are a great way of doing so. Although I prefer fresh herbs I find they always spoil before I can use the whole package. I do buy dried herbs from the local bulk store but sometimes they have a bland taste. I also wonder how long they have been sitting in the bins or jars. Previous to making dried herbs the way I am going to share with you I always pictured having plates of herbs out drying for days or hanging from various spots in the kitchen. This is an easy way to get fresh dried herbs and know exactly what is in them. Best thing is there is no extra baking or time involved...just do the following steps next time you are already using your oven! I make my herbs after we have made muffins or cookies. That is it...you can store your herbs in spice jars or leave in the bags. Now you know how to have fresh herbs that didn't involve extra electricity, time or weeks of waiting. Kids seem to like anything they can pop into their mouth or eat with their hands. 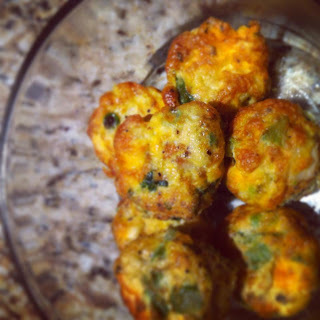 The below recipe is for easy eggs that taste great, are portable and are healthy. Swap any of the veggies listed for leftovers you have in the fridge. I always make a few extra and store them in an airtight container in the fridge, perfect for snacking or a quick protein source with toast or soup. This could easily be an appetizer for adults by adding smoked salmon! 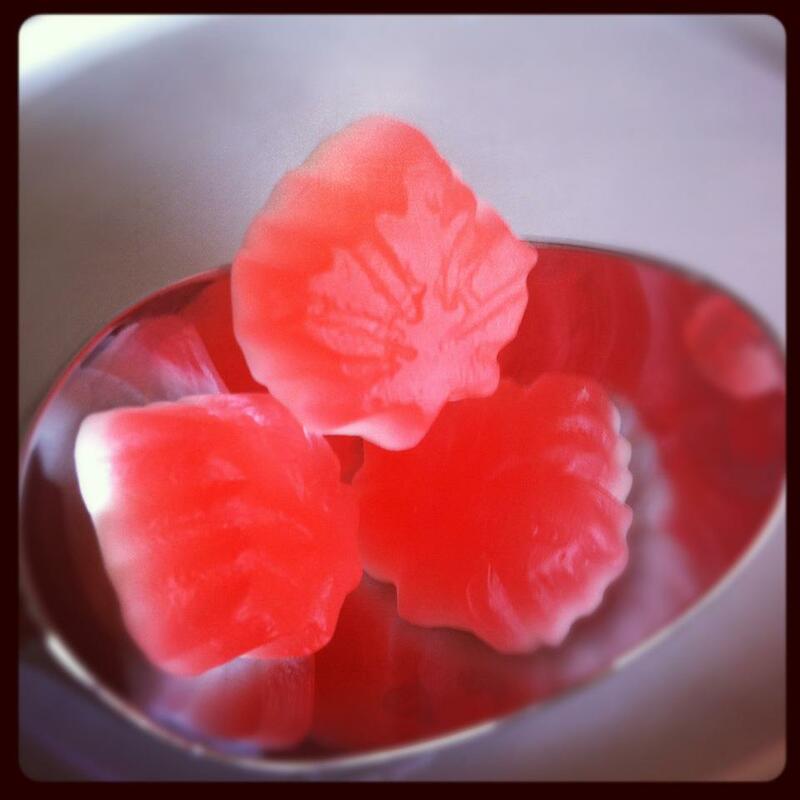 Happy Canada Day to all my fellow Canadians! Whether you are here or abroad I hope you enjoy the benefits of the long weekend! With the holiday weekend it means fireworks and treats! Here are two that I know we will be enjoying whether it is while watching the fireworks or just relaxing with friends...who really needs an excuse! 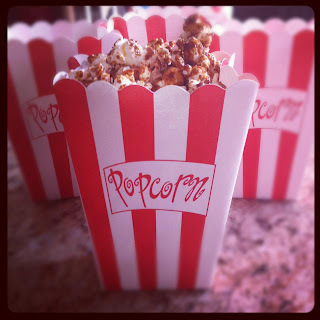 For the first one the boys and I made Homemade Caramel Corn (recipe here) and put it into cute little popcorn containers, that we picked up at Party Packagers. If you tried the recipe we made here, you probably found them to be a cake like texture and quite moist. They were a hit with children and adults a like, but I wanted to created something a little more granola-bar like but with some nutritional value. The best part about this recipe is instead of flour or any pre-bought flour substitute I ground oatmeal in the Magic Bullet. This is such a wallet friendly way of being able to use wheat free flour, if you are Gluten intolerant make sure your oatmeal says 'Gluten Free' right on the packaging. (If it doesn't, quite often it has been made in a facility that also makes wheat products.) You can use regular flour or one of your choosing as well. You can put any dried fruit you desire in. We added diced dates and apricots, for extra fiber. 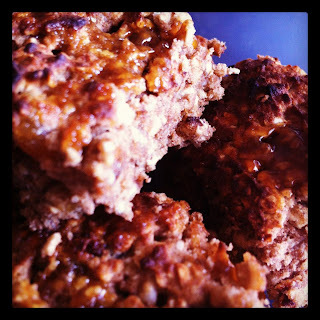 The following recipe was an attempt to find something similar to a granola bar, but a little bit more filling and healthier than the fructose ones that the stores sell. I find that by adding a little protein powder it makes the squares more filling and that much more healthy. It can be omitted though and the recipe would be equally as good. I used the vanilla one sold by Arbonne. I used Teff flour instead of all purpose flour to make it Gluten Free, but you could use regular flour if consuming wheat is not a concern. 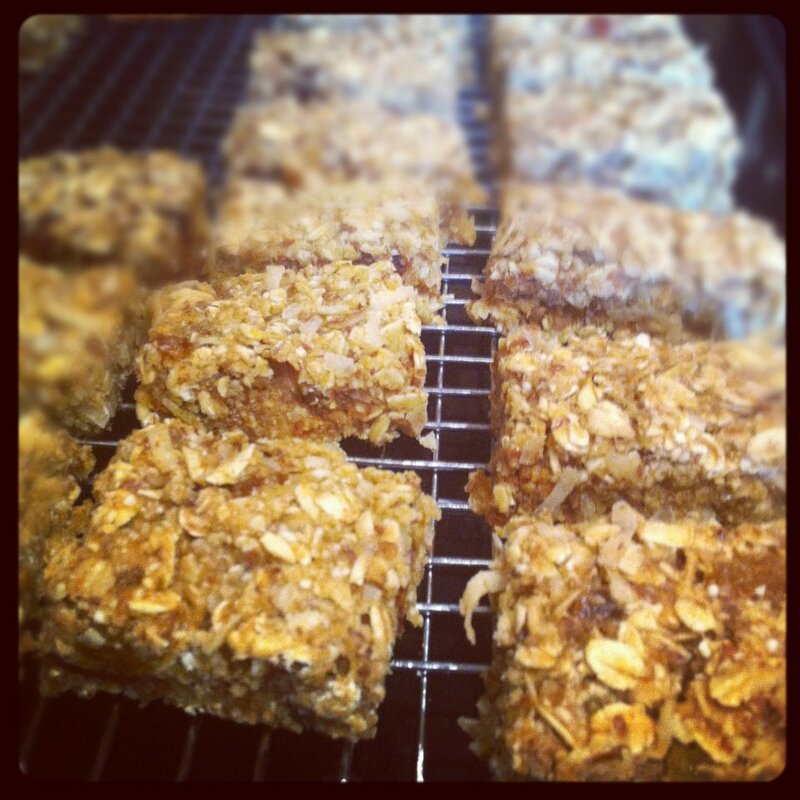 These were a hit so next time I will double the below recipe, as shown it made about 16 squares.